All staterooms are on the main deck and are twin, queen or king-bedded. Every stateroom has large picture windows, individual climate control, an entertainment center with CD/DVD and LCD monitor, private en-suite facilities including full-size shower, lavatory, vanity and individual climate control. The 350 ft² Owner’s Suite spans the main deck from port to starboard with picture windows on both sides for unobstructed views of the islands. This luxurious suite offers a king bed, ample seating, a writing desk with chair, a spacious bathroom, and plenty of storage. You’ll enjoy individual climate controls, a large screen entertainment center and mini-fridge. INTEGRITY offers six 150 ft² convertible staterooms that can be configured with one spacious king bed or two full-sized twin beds. Each stateroom offers a table with chairs, plenty of storage, a mini-fridge, individual climate controls, and entertainment center. The en-suite bathroom facilities have a full-sized rain shower, sink, toilet, hairdryer, and storage cabinet. The 150 ft² Queen Stateroom offers a queen-sized bed, ample storage, a table with chairs, ample storage, a mini-fridge, individual climate controls, and entertainment center. INTEGRITY’s Single Stateroom accommodates a single guest in one twin bed. This 120 ft² stateroom features large picture windows and an ensuite bath with walk-in rain shower and full amenities. The Single Stateroom is ideal for solo travelers as well as a child traveling with parents, located adjacent to the Owner’s Suite and opposite one of the Standard King Staterooms. Dining on the Salon Deck is one-seating at four tables, each with six-places—you can choose your companions. 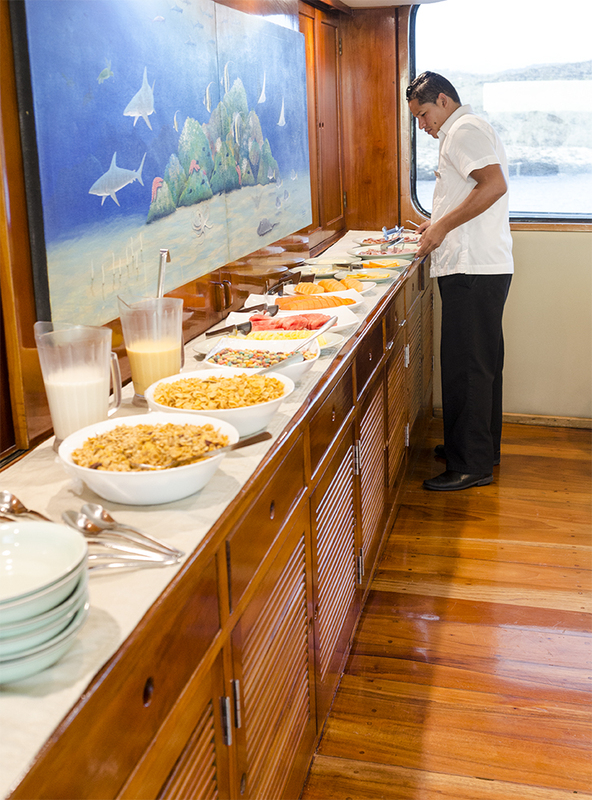 In the large, well-equipped galley the chef and his brigade strive to satisfy. Menus are varied, carefully executed and very healthy. Breakfast is buffet style with cereals, juices, fresh fruit, toast, muffins, hot items and eggs cooked to order. Fresh brewed coffee, a selection of teas, milk and cocoa are served. Lunch and dinner are served in several, elegantly plated courses and often start with a soup, followed by safe-to-eat-salads and a main course of fish, chicken, beef, seafood or vegetarian. And there's always dessert, coffee and tea. A spacious salon with comfortable wrap-around seating is bathed in natural light—perfect for reading a selection from the yacht’s library or listing to evening briefing and lectures on Galápagos natural history and geology. A wide-screen media center is used for viewing naturalist presentations. The partially covered Sun Deck is home to an additional bar, cafe tables and chairs, cushioned lounges and a jacuzzi spa. It’s the prime place to watch the Galápagos roll by, catch up on reading, nap, enjoy a drink at sunset, and stargaze at night. Named after yacht owner Rolf Sievers, Rolf’s Roost is an intimate outdoor circular lounge where you can enjoy drinks while watching frigatebirds soar in the golden evening light. 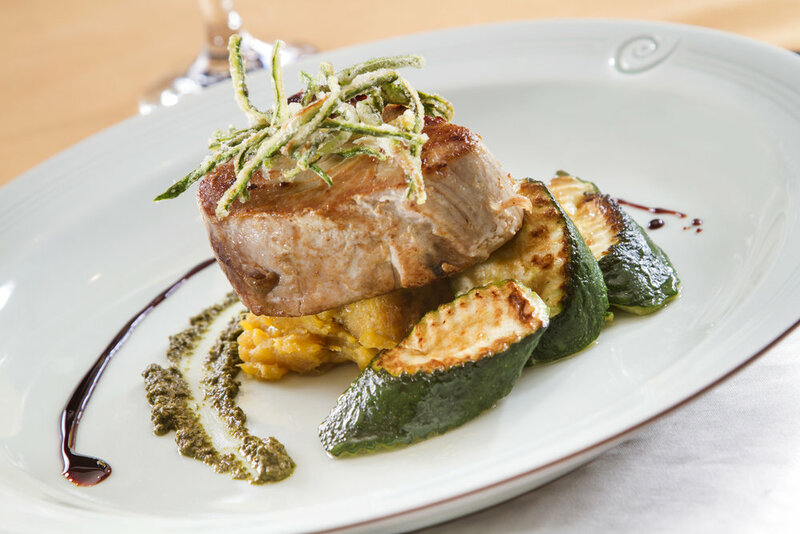 Foredeck and owner’s favorite topside venue, Rolf’s Roost.